The salmon is from Alaska. The rice is from California. The spinach was picked less than an hour before this meal from my backyard Tennessee garden. 1) Tear off the stems from the roots and brush off dirt outside. 3) Heat a little olive oil in a frying pan on the stove. 4) Add the spinach to the pan and saute for a few minutes over medium heat. Add some garlic powder for flavor if you like, but wait until about 15-30 seconds before you're finished cooking so that the garlic doesn't burn. Experiment to find the cooking time and temperature that work best for you. Basically, you want the spinach to be wilted and tender, but still bright green and vibrant. Keep the spinach moving in the pan using chopsticks, a spatula or tongs to make sure it doesn't burn or get stuck. 5) Plate it and eat it! Easy as pie and the whole thing takes about five minutes or less. 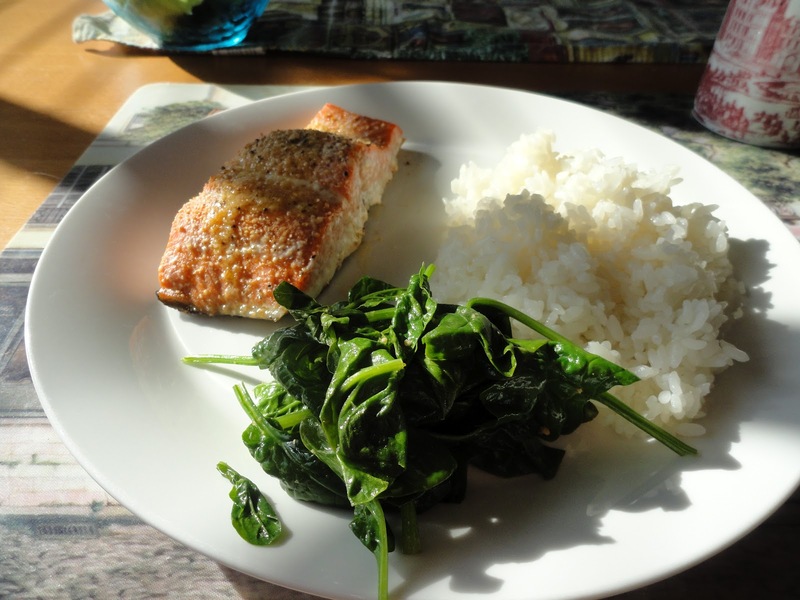 I don't add any sugar to this dish, but I swear that cooking actually sweetens the spinach. If you have children and you can get them to try it with an open mind, they may be begging for seconds on this easy-to-prepare and healthy vegetable dish! ps - Spinach, like other leafy green vegetables, tends to shrink dramatically in volume when cooked. You probably want to fill the pan to the brim with spinach leaves to start to make sure you have a decent amount of cooked spinach when you're done. To give you an idea, the spinach on the plate above probably represents two entire heads of spinach. I should emphasize that these are small heads of spinach. My spinach did not grow very big this year. I don't know why. Gardening gives you new respect for farmers and appreciation for food!